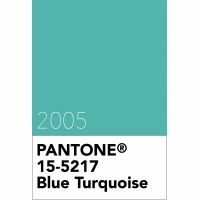 The Pantone Colour of the Year for 2005 is Blue Turquoise 15-5217. Following on from the 2004 theme of colours from nature, Pantone Blue Turquoise 15-5217, Pantone's colour of the year for 2005, takes it's insperation from the colour of the sea. Blue Turquoise is a gentler tone than true Turquoise with less green to produce a cooler hue. Blue Turquoise 15-5217 is from thePantone Fashion, Home + Interiors colour library.